IT IS FINISHED!! I’m finally done decorating Penelope’s room. Well, done until we move (likely soon). I’m very excited to share these photos with you! 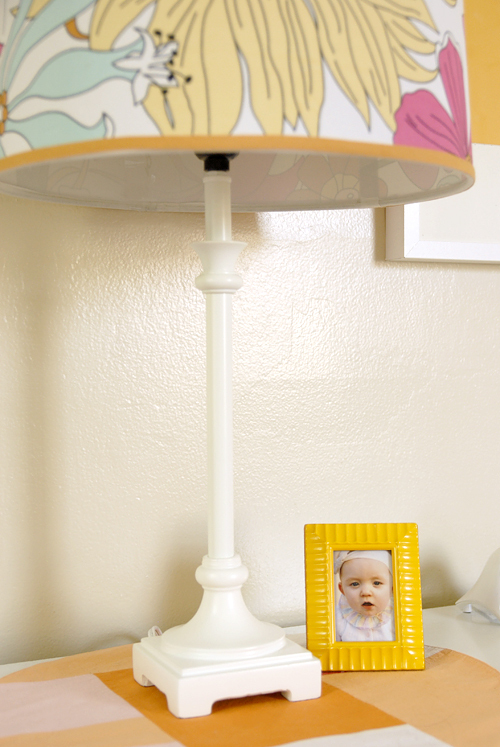 While I felt like I splurged a lot on Penelope’s room, I did manage to score some great deals along the way. Here’s the breakdown. If you don’t see it listed here, I had it on-hand already. If I could have had my own way with this space, Penelope would have white walls, teal scalloped border with teal ceiling & white hardwood floors. Lemme just daydream about this for a minute. SIGH. I actually hate this disgusting tan wall color. Any house that I actually own will never, ever have tan/taupe/beige walls. Ever. 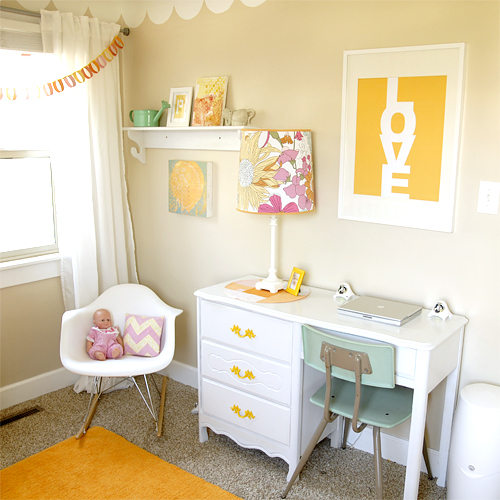 Besides that, I really love Penelope’s room. It’s fun & bright. The white furniture definitely opens up the small 8’x10′ space. Let’s talk details. Penelope has never had her own room before, she’s only ever had a closet. Not much to decorate there. When we moved to our little house, we were given a few pieces of furniture from family members to help us get started. My mom gave us her desk & nightstand from her childhood. I’ve always loved these pieces & was incredibly, incredibly excited to use them for Penelope’s room. They have such fabulous feminine details! 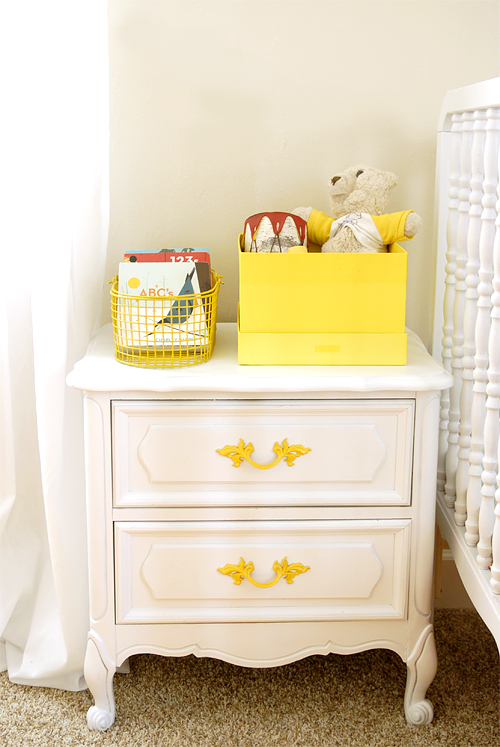 The two pieces were slightly mis-matched, so I painted the wood white & fixtures yellow to modernize the furniture a bit more. I think they turned out gorgeous!! Chris’s parents kindly handed down their crib. THE crib that they used on all six of the Esplin kidlets. THE CRIB. Can I tell you how utterly sweet it is to be able to use such beautiful, sentimental furniture?!? I love it. The crib was in need of a little facelift; I thought so at least. Chris was very resistant. I had built up this image in my head of a freshly painted white crib with matching white furniture, so it was very difficult for me to let that go. Just before I did, Chris kindly relented on the condition that I did all the painting. I’m really happy with the end result (see first pic)! The Eames rocker was a great deal. Caitlin Creer, interior designer + blogger, hooked me up with the rocker and came over to my house to help me rearrange the furniture in the room. So awesome. The furniture configuration is a lot more open, thanks to her! Sometimes it’s so necessary to have a second opinion on stuff like this. The toy bins were also the brain child of Caitlin. I was thinking of making some sort of toybox using her old crib, but that would’ve required a lot of time and mind-grapes on my part. At Caitlin’s suggestion, I headed over to ikea & coughed up $50 for the cans. I seriously don’t spend that kind of money on containers. Perhaps if I had been diligent enough with my thrifting, I could’ve found something similar for $4-15, but I was impatient & my aunt had given me a giftcard to use on something as frivolous as trash bins. 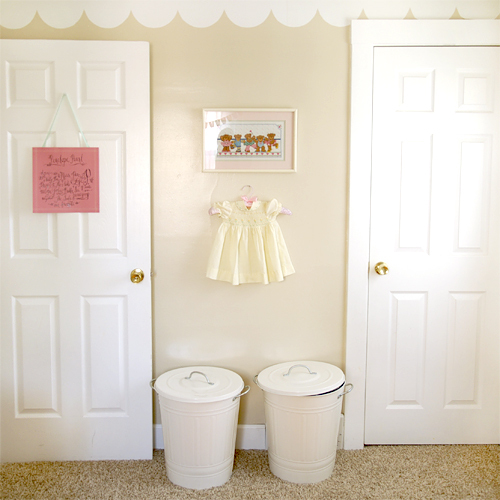 The artwork & dress above the trash bins were also hand-me-downs from my mom. My sisters & I wore that dress & Penelope wore it too. The artwork is a cross-stitch of a bunch of teddybears in tutus. AW. My mom made that back when we were little. Between my sentiments & Penelope’s love for dance, I thought I could find the perfect place in Penelope’s room to hang it. The chairs were also another Ikea splurge, but they’re so darn cute I couldn’t pass them up! Isn’t Penelope so sweet playing lunch with her baby? Also, I didn’t mention it before. . . I love the rug I found for Penelope’s room. Well, I didn’t find it. Deb over at Fresh Nest did. 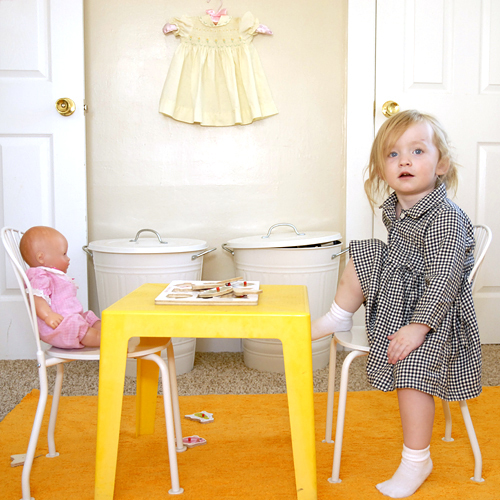 I emailed her asking where I could find an inexpensive, bright, non-cheesy rug for Penelope’s room and she responded with a great article on resources for awesome kid’s rugs. So, there you have it. I did Penelope’s room in just over $300. Not the best deal ever, but not bad. Right? 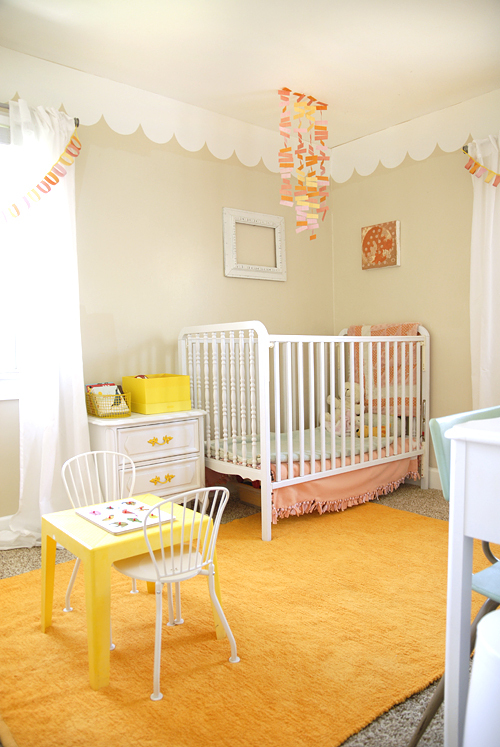 I love the spalshes of yellow and orange in this nursery – it’s so unusual and beautiful! Please come and enter it in our nursery contest– you could win $100 and I would love to add a photo of your nursery to the baby rooms gallery too. My readers would love to see it! After taking a closer look at this space, I realized that I have several of the items in this room. I had the night stand (stored it at my mother’s and it disappeared when I went back to get it), I still have the matching dresser (it’s in my room), and I have that Ikea can in red. I use the red can in the kitchen. it has held up well. I just bought a 20/30 gallon steel can for my daughter’s toys. It’s Behren’s brand. I think they offer an affordable (and customizable) solution for storage. Where are those yellow pulls from? They are so lovely! oh my, i absolutely adore this room! i saw an image on pinterest and had to come check it out! love all of the details! and can’t wait to look around your blog more! thanks for sharing! What type of paint did you use on the furniture? I see it’s from Walmart, but is there a type you used especially for the furniture? I have the same furniture in my daughter’s room and have been thinking about painting it. And did you sand it first? The wood pieces, at least? Or paint right over the whole thing? Thanks! The room is just too cute. awh i love love love it all, such unique lovely pieces. I am dying of envy from your Ikea chairs, they’ve been discontinued and I’ve looked everywhere to buy some if you want to sell them I’ll pay full price plus shipping and then some, thats how bad i want them. Your crib and dresser are beautifully done they don’t make furniture with such delicate detailing anymore. Enjoy! Just gorgeous, Love the colours, so happy I stumbled onto this page . I’ll be checking in more often. Great Ideas !! !